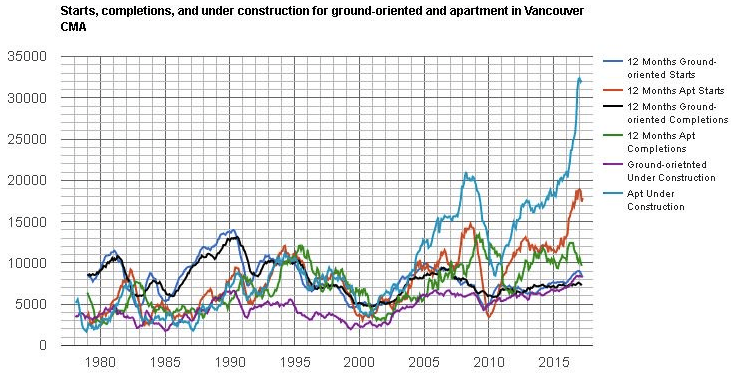 The housing boom across Greater Vancouver continues to reach new heights. Recent data released by CMHC highlights an epic proportion of new construction underway. As of February 2017 new homes under construction across Metro Vancouver are up 30% year over year. Here’s how it looks across the board comparing February 2016 vs February 2017. We’re about to witness a mountain of new supply hit the market. This is welcoming news after undergoing a record number of housing starts in 2015 and 2016 with 20,867 and 27,914 units respectively. To add to that we’re on pace for another frenzied year in 2017 with a projected 23,575 starts. As you can see we have a record number of apartments under construction with completions being flat in recent years. Construction appears to be backing up as developers struggle to complete projects. Housing completions slow to complete across Vancouver. 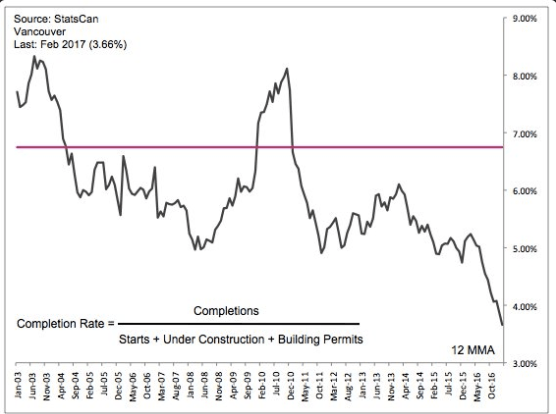 With the completion rate well below normal it’s worth questioning if developers are slowing construction intentionally or if projects are simply taking longer to complete amidst a lack of resources. Either way, construction is compounding and soon an avalanche of supply will descend upon us.